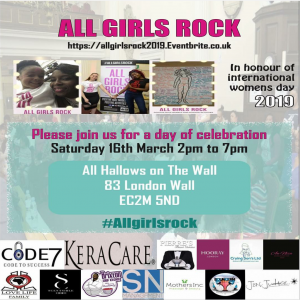 Ace Of Jacks Entertainments & Media supports All Girls Rock taking place this Saturday from 2pm at All Hallows on the Wall, 83 London Wall, London, EC2M 5ND in honour of the recent International Women’s Day. Founded by the We Rock Team, the annual event showcases, celebrates and empowers women and girls to be their better selves. By highlighting the organisations who work specifically to deliver services, support, training and other activities we can provide an arena that forges mentoring, peer networking, befriending, unity within the female population and communities which will help them to share female life experiences.